The British Dental Association estimate that around 25% of the UK population suffer from some form of dental anxiety with around 12% having extreme fears affecting their ability to attend the dentist. Visiting the dentist is key to ensuring that your oral health remains good. Without good dental health gum disease can take hold meaning that more dental treatment is possibly required, thereby exacerbating the dental fear. 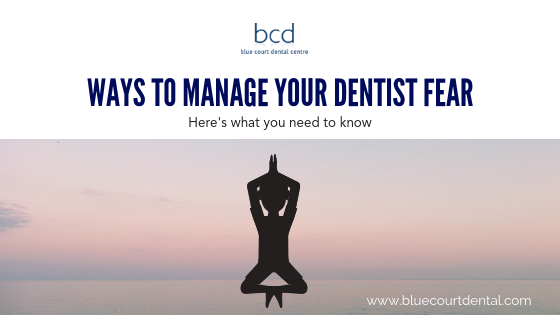 Finding ways to relax and stay calm at the dentist is what this blog post is all about. Why are we scared of dentists? The first thing to understand is that fear is a learned behaviour, think about it, we aren’t born afraid of the dentist, it is something that we have learnt to do as we have got older. Accepting this is an extremely beneficial thing to do as it means that if we can learn to be afraid then we can also learn to relax and be calm. Fear of pain is one of the most common reasons people cite for being scared of the dentist, this is quite understandable especially if people have had bad experiences in the past. What is worth noting is that modern dental care has made extremely big advances in recent years. With topical numbing gels and fine needles injections can be extremely comfortable with no pain, this then also leads to painfree treatments. Will dentists judge me and my teeth? This is often another common reason people give for not visiting the dentist, a dentist is not there to judge or to criticise, we are here to help, encourage and educate you about how to stay dentally fit and healthy. A dentist cannot achieve this goal if they are judgemental so you will find that any good dentist will support and encourage you and not be judgmental. What are my options if I’m afraid of the dentist? The really important thing to understand is that you do have options. It’s quite common that people feel they have no options, especially nervous or anxious patients. Talking to your dentist. You should always ensure you have a dentist you can trust and talk to, a good dentist will take time to listen to your concerns and ensure they take your anxiety into account. Ensuring you stay in control. Make sure you agree a stop signal with the dentist before any treatment begins. Simply knowing that you can raise your hand at any point to take a quick break means you’re in control and can really help you relax. Breathe slowly and gently. Breathing slowly and gently helps muscle relaxation generally, if you just breathe slowly and gently throughout your treatment you will find you stay more relaxed. Ask about sedation. Some dentists offer gas and air via inhalation sedation. This can also help if you are feeling anxious. Relaxation techniques are a great way to stop being scared of the dentist. Understanding that fear of the dentist is a learned behaviour and can therefore be unlearnt is a key principle to accept. Practising breathing techniques both before your appointment and during treatment can also help. Requesting an early morning appointment is also a great way to ensure that any dental phobia is contained to a short period early in the day, rather than allowed to build throughout the day. You may also find of bringing a friend with you can help to keep you calm. Enjoy a cup of green tea. Green tea has been shown to have a chemical, L-Theanine, which has been shown to elevate levels of serotonin and dopamine in the brain which can help you relax. Chew sugarfree gum. This can help to keep saliva flowing and prevent your mouth from drying out. It’s also been shown to lower anxiety and control cortisol levels. Of course you can’t do this whilst in the chair! Remember to breathe slowly and gently. You could do this in the waiting room of the dental practice and during treatment to help relax. Visualise your happy place. Most people have a happy place that they think of, this could be a holiday or a time you spent with friends. Visualising this whole experience can be extremely relaxing and calming. Listen to calming music. This type of music can be different for each person but listening to the music you find relaxing and peaceful can also help you with your dental anxiety. We hope you have found the information contained in this blog post useful, our dental practice in Harrow is a friendly and calm practice, taking time to listen to your needs and concerns and help out wherever required with any dental fears. This entry was posted in Dentistry, Questions & Answers, Share This Post and tagged calm, Dental anxiety, fear, phobia, relax, scared on 5 November 2018 by Dr Nishan Dixit.